By Stephanie O’Neil, reporter KPCC news. For many Southern California high school students, summer is synonymous with surf, sand and sun. But, for some of Los Angeles’ top math and science students, the lure of the beach and traditional summer fun fizzles fast when compared to microscopes, slide kits and real-life stem cell research. Armed with little more than protective gear and enthusiasm, 20 overachieving teenagers have been clocking 40-hour weeks in the lab at USC’s Eli and Edythe Broad Center for Regenerative Medicine and Stem Cell Research. Among them is 17-year-old Brian Tom of Lincoln Heights. Stem cells offer promise as a treatment or cure for many diseases because they can be can induced to morph into other cell types — such as brain, muscle or skin cells. Stem cells can also divide without limit, which gives them the potential to repair and replace damaged tissue. “You can just imagine the possibilities,” says Sophie McAllister, a 17-year-old senior at Harvard-Westlake School in Los Angeles. McAllister works with a USC mentor on cardiac cell regeneration. McAllister and nine other students are in a program that’s privately funded by two donors with ties to USC. Meanwhile, Tom and his summer school classmates are studying under a statewide program funded by the California Institute of Regenerative Medicine (CIRM), a voter-created agency that funds stem cell research throughout California. CIRM has invested $1.7 million in nine high school summer programs statewide for three years. 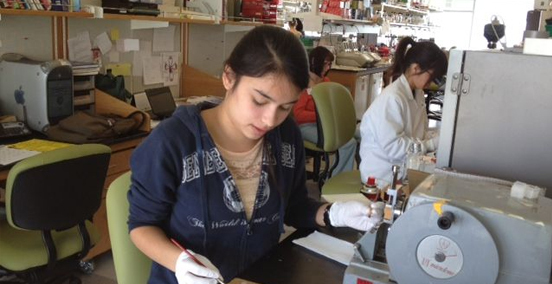 The two programs share the goal of nurturing stem cell interest among California’s top math and science students from all across the socioeconomic scale. Each Friday, she says, the students from both programs attend forums or lectures, which typically focus on data analysis, scientific writing and the ethical issues involved in harvesting stem cells from discarded embryos to create new cell lines. But, most of the time, they’re upstairs working in the 5th-floor lab with mentors who are doing actual stem cell research. On a recent afternoon, McAllister demonstrated how she makes microscope slides containing minuscule heart cells for the researchers in her program. Next to the machine sits a large computer monitor that displays the mouse cells, each stained in bright colors. “This is actually the whole mouse that was sectioned, but this part’s the heart,” she says, pointing to a bright blobby mass indecipherable to the uninitiated eye. In an adjoining lab, Tom spends his days helping researchers clone new cells so they can study certain perplexing stem cell behaviors. Solving these mysteries is a thrilling prospect to the students in USC’s stem cell program, even if that sometimes means sacrificing friend-time. A lifestyle that Sophie McAllister and Brian Tom say is well worth the time they’re investing. The students complete their summer session with a colloquium open to the public on Aug. 10 from 11 a.m. to 3 p.m. in the first floor seminar room at USC’s Broad Center.